The cheerful sounds of babies and their families filled the Wichita State Hughes Metropolitan Complex on Feb. 27 during Baby Day, an interprofessional event hosted by the Communication Sciences and Disorders (CSD) and Physical Therapy (PT) departments in the College of Health Professions (CHP). 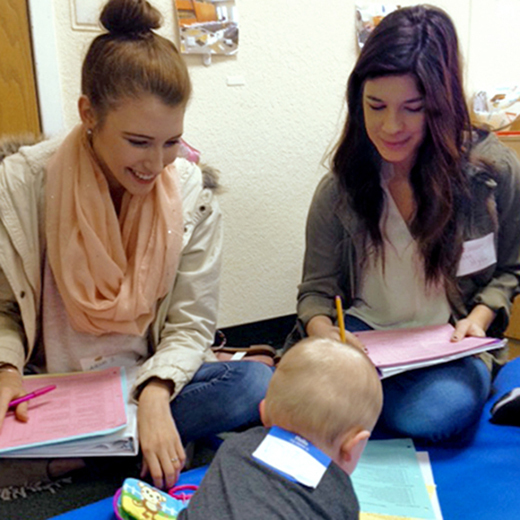 Baby days are held each spring when pediatric classes are taught. CSD Associate Professor Kathy Strattman and PT Professor Barbara Smith host the event on different days, and students from each department participate in both sessions. The event provides students, families and professionals an opportunity to gather and learn more about the development of infants and toddlers. Throughout the day, five groups of babies representing five stages of development were evaluated. The babies’ ages ranged from newborn – 12 months. CSD students, along with Strattman, spent the morning watching, listening, and asking questions about the babies’ reactions and other verbal skills. The group was joined by Douglas Parham, associate professor in the CSD department whose specialty is infant vocalization. Parham was able to contribute additional insight on speech development milestones in infants and toddlers. PT students, along with Smith, focused on the babies’ physical movements and demonstrated how reflexes and motor skills support young children’s development. Smith has been conducting baby days in the physical therapy department for over 25 years. Eight years ago Strattman decided it would be beneficial for the CSD department to join and create a more diverse experience. Having students from both programs participate teaches them what health care professionals in other fields look for and how to provide comprehensive patient care. “After my first experience with the PT Baby Day, I decided CSD should host the event as well for students to really see how motor development and communication go hand in hand,” said Strattman. She believes baby days are a positive experience for everyone involved and a great way to enhance the education of the students. Department alumni who volunteer their children for observation also enjoy participating and often ask throughout the year when the next Baby Day is.